As the amount of job openings approach record highs, the amount of time that Americans spend away from work is rising as well. 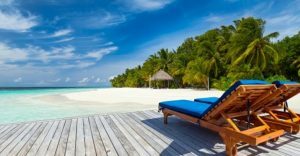 Amongst full-time workers that are offered paid time off by employers, the amount of vacation being taken has increased for the third consecutive year. The average time workers take per year has reached 17.2 days or equal to more than three Monday to Friday work weeks, showed a recent study. A lead researcher in the study said there was more confidence amongst employee now than just a few years ago. In addition, employers are now giving more time since they are more cognizant they must compete more to win top talent. The increase reverses a long-term decline in vacation usage that began during the 1990s. Between the 70s and 90s, the average U.S. worker took more than 20 days per year off, even during the recessions. However, in the early 2000s that average began to drop and almost a full week was lost between 2000 and 2014, said the recent study, as the average fell to just 16 days during 2014 prior to reversing. The study has found that the average time that workers earned, as opposed to what they actually took, was 23 days. This means workers are now leaving over a week of paid time off sitting on the table. The vacation is part of employee’s pay package, which means if they do not take it they are effectively working for free. Americans are still working more hours than other residents in industrialized countries. U.S. employees work close to two weeks more each year than their counterparts in Japan while working close to three weeks more than those in Australia. Mexican workers hold the title for working the most with an annual rate of 2,255 hours which is equivalent to working 43 hours per week for 52 consecutive weeks.